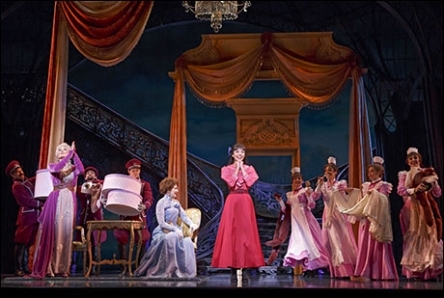 Frothy as the finest champagne and glittering like the most precious emerald, Gigi makes a welcome return to the Broadway stage. Leading lady Vanessa Hudgens proves more than up to the task of carrying the sumptuous show, as she throws herself unreservedly into giving a polished performance of the endearing title character. The sum of Hudgens’ combined singing, acting and dancing talents are enhanced by a charming stage presence that draws and holds the eye whenever she is on stage. She clearly traces Gigi’s development at a key time, from awkward, trusting girl to assured young woman. To her great advantage, Hudgens is surrounded by a terrific leading man and three character actors drawn from the upper echelons of Broadway royalty. 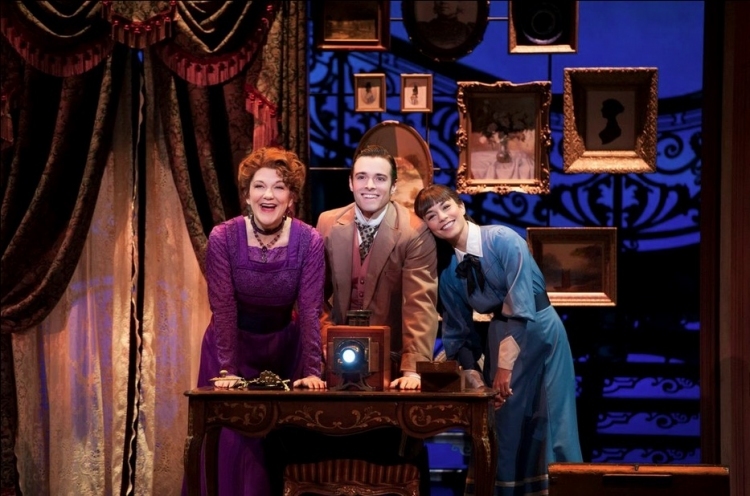 Corey Cott is sensational as “sugar prince” Gaston Lachaille, a coveted young bachelor. Cott’s singing of title song “Gigi,” as Gaston who finally sees his young friend Gigi as a mature young woman he loves, is truly electric. Victoria Clark creates yet another character of great warmth and heart as Gigi’s Mamita (grandmother). Sparks fly between Clark and fellow Broadway stalwart Howard McGillen (as Honoré) as they sing classic duets “I Remember It Well” and “I’m Glad I’m Not Young Anymore.” Willowy Dee Hoty completes the highly experienced trio as Gigi’s Aunt Alicia, relishing her role as the jewel-encrusted society matron and definitive snob. The song “Thank Heavens For Little Girls” has been re-assigned to Mamita and Alicia to avoid any potentially insidious implications of the song being sung by an elderly man. As Eliza Doolittle studied voice, Gigi studies deportment, grooming and jewelry. 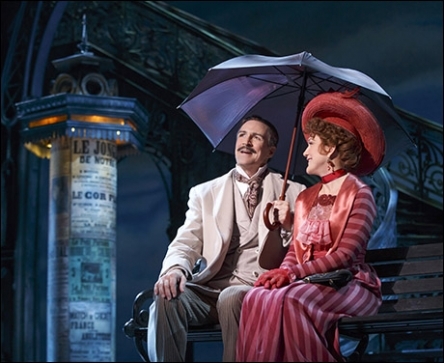 Heidi Thomas’ adaptation of Alan Jay Lerner’s book almost reaches breaking point in the portrayal of the deeply superficial lifestyles and the avaricious pursuit of wealth and material possessions, until the scenario is ultimately resolved through dear Gigi’s and Gaston’s pure and transcendent love. The running joke about suicide, however, could surely be cut in the name of good taste. Hearing Lerner and Frederick Loewe’s ravishing score is a pure pleasure. Joshua Bergasse’s choreography does not reach the classical heights of On The Town, but it is sharp and stylised. 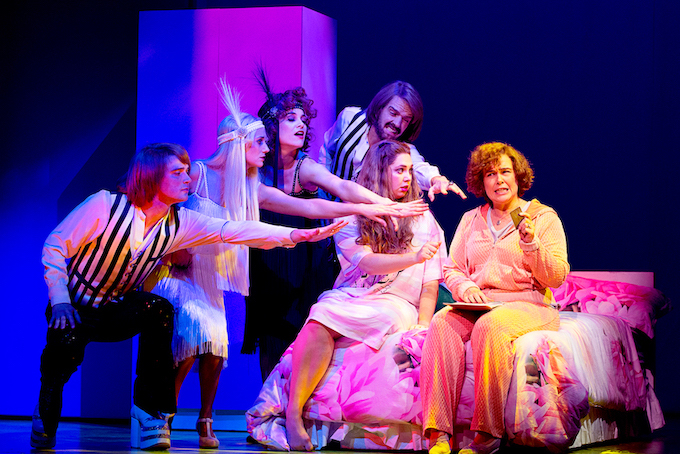 Act one finale ‘The Night They Invented Champagne” is a true highpoint of energy and excitement. 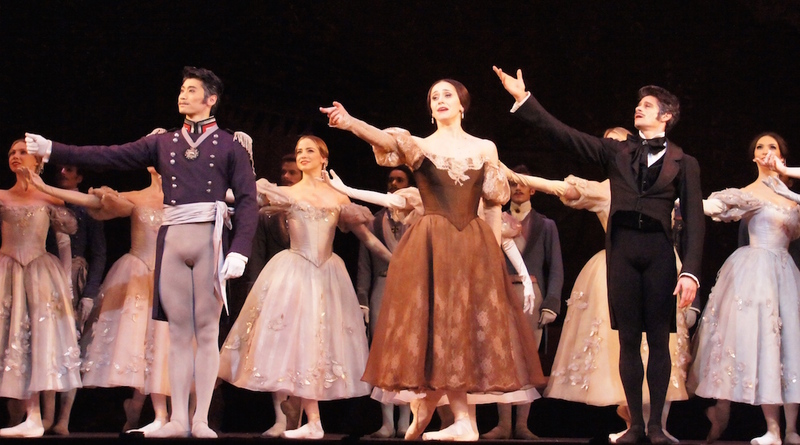 Director Eric Schaeffer has achieved a uniform playing style from the cast, channeling their energy and focus to stretch out the slender conceit of the operetta-like plot over the length of the show. 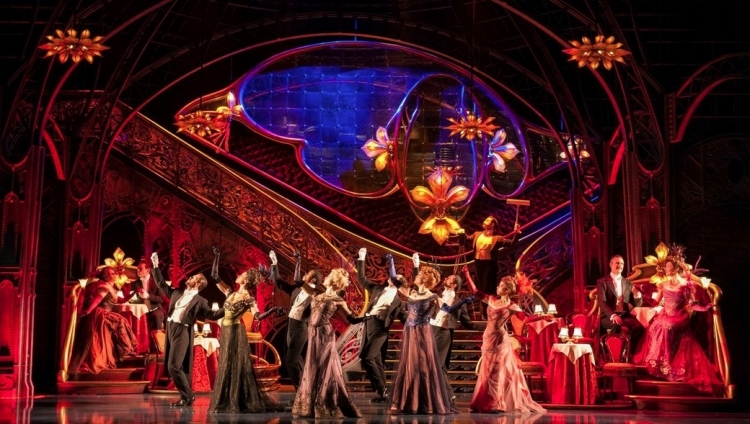 Derek McLane’s belle époque set design is based upon a double staircase, housed under the wrought iron curves that suggest the Eiffel Tower, which had just been built when the story is set. Various set pieces are added to create new locations, with the most sumptuous being the glowing red booths and lights of Maxim’s. Natasha Katz’s lighting brings out all kinds of details in the setting, and help to create the various locations. Of chief attraction among the accomplishments of the creative team are the costumes of designer extraordinaire Catherine Zuber. A master of colour, Zuber uses a delectable palette of pinks, purples and reds to paint the elegant trappings of a bygone age. Feathers and floral attachments are skillfully used to add visual appeal. 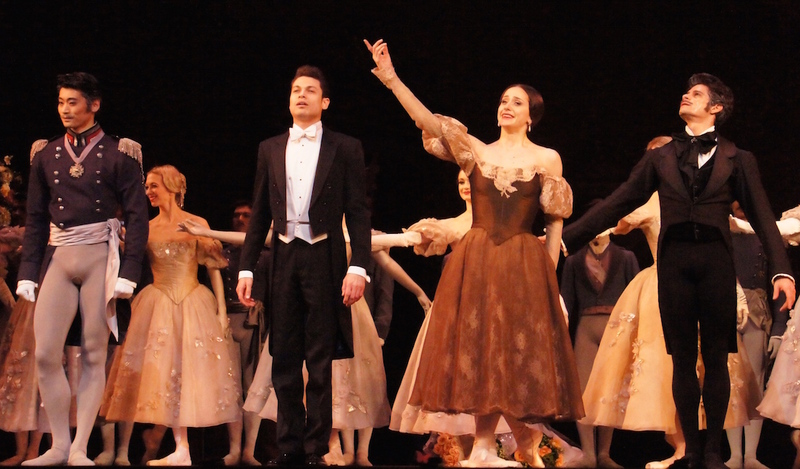 Gigi’s development is charted expertly through her costumes, and any show that gives the leading lady a new dress for the curtain call is a lavish one indeed. 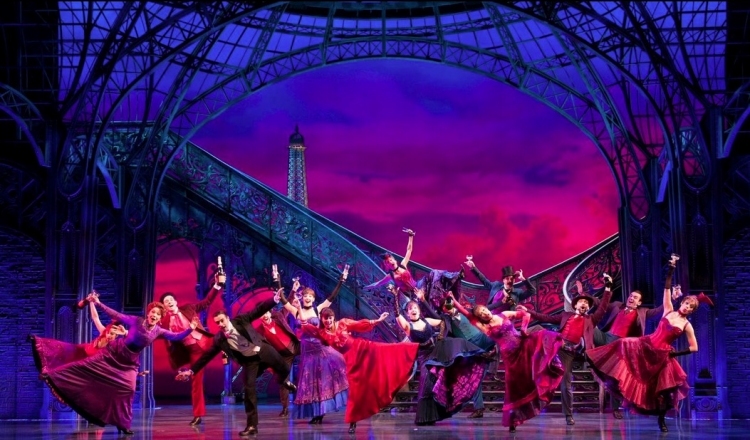 Sure to be enjoyed by mothers and daughters, and music theatre fans seeking a return to the golden age, Gigi is designed to send the audience smiling out into the night. 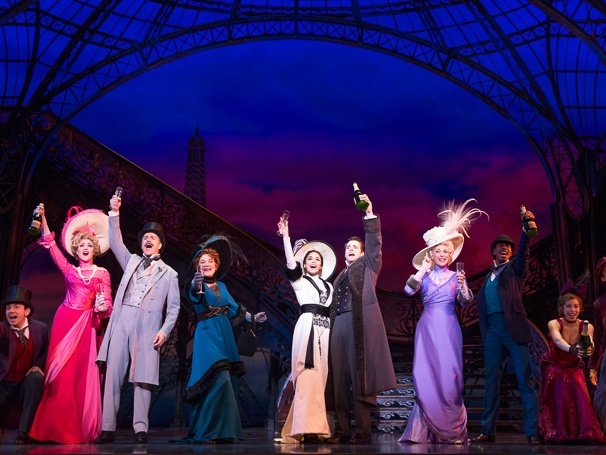 Gigi was reviewed 8pm Monday 6 April 2015 plays at Neil Simon Theatre, New York.